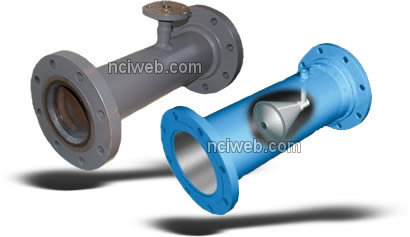 Annular Venturi desuperheaters reduce steam temperature by bringing superheated steam into direct contact with water. The steam is cooled through the evaporation of the water. These desuperheaters are recommended for use under a wide range of conditions, including steady and variable flows. They can be installed horizontally or vertically up. When installed vertically up, turndown ratio can be increased substantially. Operation: Superheated steam is directed by the cone into the annular area between the cone and pipe wall, increasing both velocity and turbulence. Cooling water is introduced through a narrow slot (or small jets in the 1" and 1-1/2" sizes) in the cone at the point of maximum velocity. The combination of velocity and turbulence improves atomization and produces maximum desuperheater effectiveness. The water pressure required should equal the operating steam pressure. Performance: Annular Venturi desuperheaters are normally used in areas where atomizing steam is not available. Turndown ratio is dependent upon a wide variety of factors, such as installation (horizontal or vertical), amount or residual superheat, and pip­ing. Depending on exact flow conditions, units are capable of 20% to 2% flow variation. Pressure drop normally varies between 2 psi and 10 psi. Construction, Sizes and Ratings: Sizes 1" thru 4", all stainless steel. Flanged units have 150 or 300 lb. stainless steel R.F. flanges. Sizes 6" thru 16", carbon steel with stainless steel water pipe and venturi cone. Flanged units have 150 or 300 lb. R.F. flanges. Stainless steel units have all stainless steel wetted parts and carbon steel lap joint flanges.